On Episode 187 of CrossFit Radio, host Justin Judkins interviewed Betsy Finley, who won the 60-Plus Division at the 2011 Reebok CrossFit Games, and Josh Bridges, who finished second overall at the Games. This episode was webcast live at 6 p.m. PDT on Wednesday, Aug. 31, 2011. 3:40 Betsy Finley, 61, is a professional school administrator who lacks an athletic background, yet she placed first in three out of four events at the 2011 Reebok CrossFit Games. She explained how her coach said he wanted her to try competing in the Open, so she did. She was sold once she found out there were age divisions. Finley talked about this year’s competition and the programming, and she addressed the criticism that the masters athletes were not given the attention they deserved. She described her overall experience and shared her biggest take-away was from this year’s event. 29:10 Josh Bridges was hurled into the spotlight when he placed second in the Open. He went on to dominate his regional and then placed second overall at the 2011 Reebok CrossFit Games. Josh gave his opinion and perspective on the programming at the competition and how he strategized for the different events. He described what his experience was like the week of the Games and how he had an advantage with CrossFit Invictus athletes there to support him. 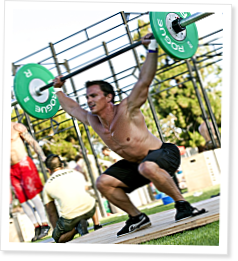 Josh explained how he found CrossFit and reflected on the times he would haul his gear around in his car and do WODs at parks or track-and-field venues. He also offered some great advice to any CrossFitter looking to step up his or her fitness. Thanks Justin, for a great interview with the Reebok Master's class, 60+ winner, Betsy Finney. I am 48 and new to Crossfitting. I've been working with CrossFit Marina in Huntington Beach since February. I volunteered at the Long Beach Regionals and attended the 1 day of the Home Depot games. At the regionals, I saw what it took to put on an event like this for 3 days. The local affiliates put their lives on hold to host the games and huge numbers of their members came out to help. At the games, I enjoyed watching the master's group most of all, wondering all the time, if I will ever be at that level. Fast forward to your podcast with Betsy. I loved listening to her story and how Crossfit has changed her life. I was inspired to try harder in my future workouts in hopes of trying for the open next year...assuming I get my first pull up soon.